Join TeenTix and Taproot Theatre Company for an evening of activism, inspiration, and the celebration of young voices! Start the night in the upstairs lobby with pre-show snacks and swag from TeenTix! Then, settle in at the Jewell Mainstage Theatre for We Will Not Be Silent, a story that follows Sophie Scholl: a 21-year-old German theology student who opposed Hitler and the Nazi regime. After the show, stay for a FREE panel discussion about racism and white privilege, part of the Raised Voices series. TeenTix Members can buy tickets in advance right here! Select your seats at any price level, and when you check out, enter the code NOTSILENT for $5 advance tickets. And remember, Thursdays at Taproot are 2 for $10 days. Questions? Call Taproot's Box Office at 206-781-9707. Twenty-one-year-old Sophie Scholl is a college student, anti-Nazi activist and, along with her brother, a member of The White Rose resistance. 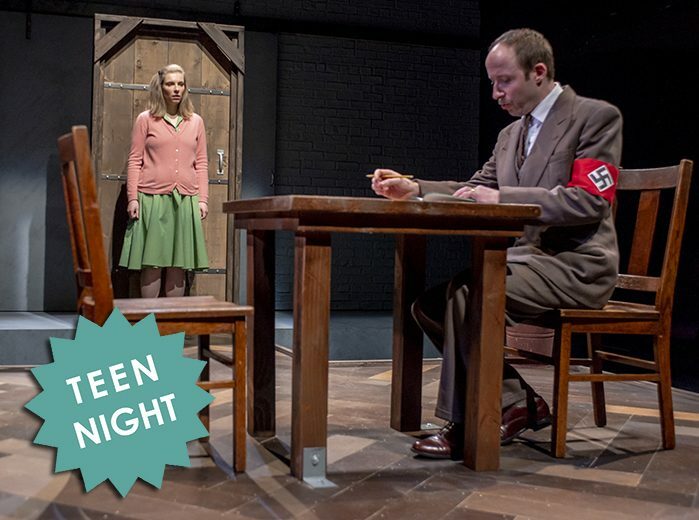 Charged with treason and held in a German prison, Sophie is forced to play a psychological game of cat and mouse as she fights for her life and soul with a Gestapo interrogator. This emotionally charged story testifies to the courage required to live out your values. Learn more about the show here! TeenTix Members can get advance tickets to this performance online by entering the code NOTSILENT at checkout! Tickets can be purchased here.